Limited Print There are	186 products. Limited Edition decks that will never be re-printed again. Once we're out, we're out! "Cool & elegant, as expected." The Allure playing card deck is a design that is elegant and mysterious at the same time. We have put together a deck with not only the collector in mind but also the Cardist, Magician and the everyday card player. From a lineage of design eloquence comes a new deck of playing cards rendered in platinum. The Ornate series exudes elegance and class. Meticulously designed by Randy Butterfield. These beautiful, detailed decks will heighten the impact of any magic or flourish routine, or add a high roller feel to your poker table. A box of fully illustrated custom Bicycle cards with an Elves & Orcs theme. Elves are red, Orcs are black, every card is unique. Bring a little fun to your card game, or add a deck to your collection. This is the newest and most beautiful installment of the widely collected Split Spade series. The new box features embossing and silver foil stamping. They feel and handle as well as any Split Spade in the series. Designed by Magic Makers, Inc. & printed by US Playing Co. This poker deck screams yellow across your spectator’s eyes with full color court cards sporting black and red pips! Artist Noel Quiles, launches his last creations: King of Kings Black Limited Edition. The whole set of cards, including pips, numbers and court cards have been redesigned. The deck uses royal colours red and gold to great effect. The traditional court and pip designs are "washed out" on a concrete wall where the elements of stencil-style graffiti imagery are the energising and vibrant pop. An Urban Punk theme in the Stencil Style Graffiti motif. Inspired by the Dragons of lore, Draconian Spitfire are a premium custom Playing Cards. The Back Cards feature a Borderless optical illusion design formed from Dragon Scales. The Face Cards incorporate a clean design that keeps them very functional and provides the highest level of playability. The Ancient Machine deck is a unique concept….One for the ages! has the makings of a futuristic, yet olden day design. You will get lost in intricate lines and shapes in the court cards along with the pips. The Bicycle: One Million is a deck like no other. We have combined the best materials with an elegant, breathtaking design. Featuring a blend of ornamented and intricate elements that preserve the classic aesthetic values of the Elite brand. Designed for professionals and collectors. The ultimate in refinement. Designed by Ade Suryana, the Aquila decks contain exotic and elegant details throughout. The Aquila back features intricate borders and detailed patterns adapted from popular Balinese textile design. The Holmes Edition features a simple but elegant tuck case, that features intricate embossing and also gold foiling. With it's unique villain court card set, the Hound of the Baskervilles Playing Card Deck will make a wonderfully dark edition to your playing card collection. The black on black foil stamped tuck case is embossed and finely detailed, on both the inside and the outside. 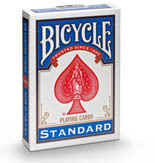 Introducing the Bicycle Evolution: a magical, complex, and intricate deck of cards. The result is nothing short of incredible: Fascinating from every angle, this deck transcends time and space, from the edge of infinity to the depth of the absolute. Yet another great reverse printed deck from Bicycle These pink cards are perfect for bringing some flamboyant color to your act. Great for use in any number of Card routines! The retro-looking playing cards from magician and cardist Zach Mueller are back in blue. Jackson illustrated the deck in his trademark style, with influences from the same engraving style found on US currency. Each court card contains a famous player from the American Civil War. The Gold Bicycle playing cards are the epitome of elegance and class. A meticulously crafted, and elegantly refined deck. A premium deck designed for the most discerning collectors, magicians, and players. The Bicycle Pyromaniac Playing Card Deck by Ana Albares is the hottest Playing Card deck yet! Johnny Whaam’s original art work of the Old Masters playing ca(made nerds w )is a truly stunning piece of art! A Limited Edition deck of premium quality playing cards featuring the board game piece - the Meeple! Free game counter cards included. Utopia: A seemingly perfect and ideal place. When ideals collide, Utopia descends into Dystopia.